Cauliflower. I have a relatively new appreciation for cauliflower. It started when I learned that roasting it at high heat produces something of utterly transcendent sweetness. Nothing like the sad bowl of plain steamed stuff sitting on my childhood kitchen table, or the pile of raw browning florets untouched at nearly every salad bar and on every crudité platter. Because of my new relationship with this member of the brassica family, I have been more open to recipes starring cauliflower. That is a good thing because this beauty just got a permanent spot in my repertoire. I recently read somewhere that there is a crisis in the saffron world. Because it is so labor intensive to harvest and so expensive, much of the saffron we pay so dearly for is not actually saffron. In other words, it is not the stamen of the crocus flower but the stamen of other flowers, most notably safflower. Saffron’s aroma is unmistakable (like pot’s aroma is unmistakable – sorry), so be sure to take a whiff of whatever you buy. The high price is worth it for the scent, gorgeous color, and subtle pungent flavor. Just a pinch here flavors this whole dish. Sure there are also olives, bay leaves and raisins, plus red onions that get cooked down so much and so nicely that even I, who am not usually a huge onion fan, didn’t pick them out. But the saffron is what makes the dish. Buy carefully. I made this as a side dish served warm one night and served it cold as a salad the next. 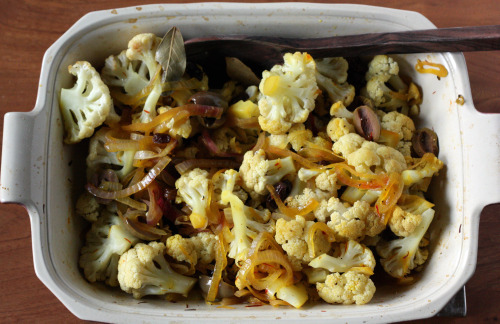 Overnight in the refrigerator made the color of the cauliflower more golden and the flavor more intense, so don’t hesitate to make this ahead of time. Because this is an English cookbook, all the measurements are metric. I chose to eyeball the ingredients rather than whip out my scale which you will see reflected below. Preheat the oven to 400ºF. Put the saffron strands in a small bowl and pour over the boiling water. Leave to infuse for a minute, then pour the saffron and water into a large mixing bowl. Add the remaining ingredients plus a large pinch of salt and a few grinds of pepper, and mix everything together with your hands. Transfer the mix to a medium ovenproof dish, cover with foil, and place in the oven. Cook for 40-45 minutes, or until the cauliflower is tender but not too soft. Halfway through the cooking time, remove the dish from the oven and stir well, then cover again and return to bake. Once the cauliflower is cooked, take it out of the oven and remove the foil. Season to taste with salt and pepper and serve warm or room temperature. My very favorite vegetable! Why is it that I never think of it in until winter?? I love it this way, Sicilian style w/ raisins and Sicilian green olives, next time I will try the saffron addition! Happy Labor Day my friend. 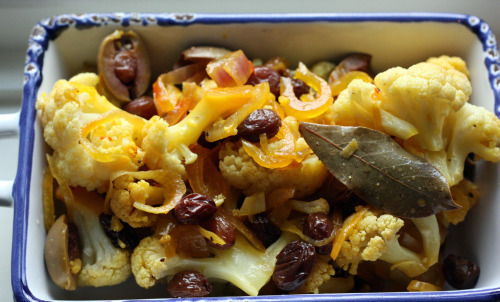 I’ve been a cauliflower lover for a long time and the way you describe it with the onions and the olives and the SAFFRON (mmm good stuff) makes me want to make this dish instantly. I’m not grilling this holiday season either. Possibly because I don’t have a grill but mostly because I have to learn the different folds and lobes of the brain. Sigh. Not fun. At least I have this dish to look forward to! I love cauliflower and I have a tiny one from our csa this week. I’ve never tried saffron and don’t know if I would be able to tell the real from the not-real! My love for cauliflower grew as soon as I took your advice and roasted it one high heat. Now it’s my favorite way to eat it! I always wondered why saffron was so expensive, thanks for the info. I’m always on the lookout for new cauliflower recipes. And actually, I have the saffron on hand and never know what to use it on/with! I love cauliflower! And I’ve never made it in this way (or in any interesting way)…must hop to it! I grow my own saffron here in the Pacific Northwest. A small patch supplies me with nearly enough saffron for a year (and my husband puts saffron in everything). By the way, you left out the onions in the list of ingredients. Do they go in the pan raw or are they cooked first? I’m loving the combination of ingredients in this dish! And I agree that roasting cauliflower at high temperatures is so very delicious. 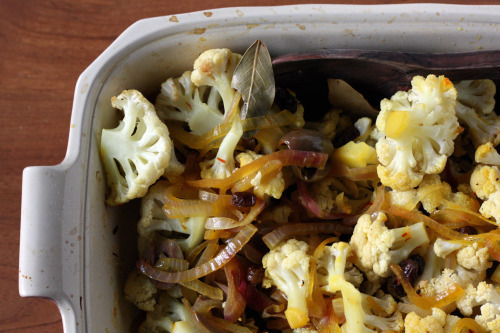 Love roasted cauliflower, but I never think of going beyond olive oil and sea salt. I will definitely being trying this recipe this fall! Love the combination of flavors ….. warm and comforting! What a lovely healthy Mediterranean dish – thanks for sharing it!